1 to 49 FTE (full time equivalent employees, based on a 40 hour work week): employees accrue 1 hour for every 50 worked; up to a 40 hour cap (5 days). 50 – 249 FTE: employees accrue 1 hour for every 35 worked; up to a 56 hour cap (7 days). Over 250 FTE: employees accrue 1 hour for every 30 worked; up to a 72 hour cap (9 days). Over 1,000 total employees using PTO (for example, plans that combine vacation and sick time): provide leave equivalent to at least 1 hour for every 15 hours worked, with at least half the time available for paid sick time. Note: Business size is based on total employee hours rather than the number of individuals working, and assumes 40 hours as a “full-time” work week. A company with 10 employees each working 40 hours per week and a company with 16 employees averaging 25 hours per week both have 10 FTEs, since both have a total of 400 hours worked per week. 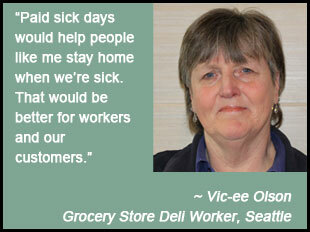 Full-time, part-time and contract workers all accrue paid sick leave under the proposed ordinance. For the employee’s illness or injury, diagnosis, treatment, and preventative care. For health needs of a child, spouse, domestic partner, parent, parent-in-law, or grandparent. To deal with the consequences of domestic abuse, sexual assault or stalking. If a place of business, or a child’s school or place of care, is closed for public health emergency. PTO and other paid leave: Employers who do provide PTO or more generous benefits do not have to change their policies as long as the minimum number of hours specified above is available to the employee as sick or safe time. Shift swapping: With the consent of their employer, workers may swap shifts instead of taking paid leave. Employers with fewer than 250 FTEs may provide employees the option of accessing their paid leave bank by choosing either paid sick pay or a mutually agreeable shift trade. Carry over and caps: Accrued leave up to the cap carries over into the next year. Employees are not entitled to use more leave than their capped amount in a year. Prorated cap for part time workers. In companies with fewer than 250 FTEs, the cap for part-time employees is prorated based on the two highest quarters of the past 12 months. Waiting period for new employees: Leave begins accruing immediately, but employees aren’t entitled to use it for 180 days in companies under 250 FTEs, and 90 days in larger companies. Compliance: Businesses under 250 FTEs have 1 year from passage; larger companies have 180 days. New businesses opening/relocating to Seattle with fewer than 250 FTEs have 2 years. Collective bargaining agreements: Does not apply to employees covered by a bona fide collective bargaining agreement if such requirements are expressly waived. Enforcement – The Office of Civil Rights will investigate complaints following existing employment discrimination enforcement processes. Protection for employees: Employers cannot retaliate against employees who use earned sick leave in accordance with the ordinance. This is great to see! Philadelphia just, after thousands of activists rallied for it, passed an Earned Paid Sick Days bill through their city council. It’s expected the mayor will veto it. Keep up the fight!